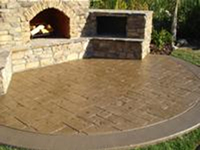 Do you already have a plain gray concrete patio or porch that's still functional but not very exciting to look at? You don't need to rip it out and start over to upgrade its appearance. There are several ways to give existing concrete more color and eye appeal. 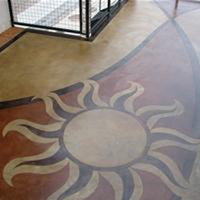 Depending on the condition of the concrete and your budget, the options range from a simple color enhancement by applying a coat of stain to a total makeover by covering the concrete with a decorative stamped overlay. See these before-and-after projects. You'll be amazed at the results! 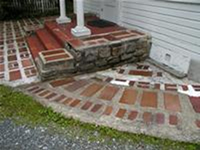 This home's tile-covered entryway and brick-like walkway had clearly seen better days. The tiles were starting to delaminate and spall. They had also become slippery and hazardous when wet. The owners of this rental property needed an economical solution to restore the entryway and improve curb appeal. The entire area was resurfaced and covered with a 1 ½ -inch layer of reinforced concrete which was then stamped and hand chiseled to look like natural stone and tile. Deep grout lines and a nonslip surface enhanced the appearance. 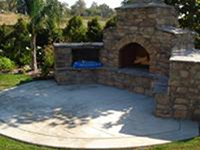 Project submitted by Unique Concrete, West Milford, N.J. 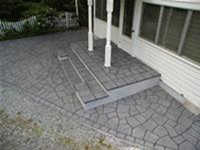 This plain-gray concrete porch and sidewalk were transformed by engraving and acid staining. The Appian stone pattern and reddish-brown stain complement the brickwork of the home's exterior. Project submitted by Capstone Concrete, San Diego, CA. 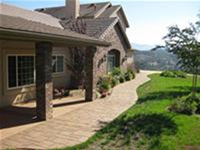 Oxidation had ruined the appearance of this home's rundown concrete patio and walkways. Water-based stains and colored borders brought them back to life. 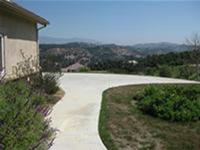 Project submitted by Staintec, Rancho Cucamonga, CA. A stencil of the sun and bold colors make this restaurant patio an inviting spot for outdoor dining. 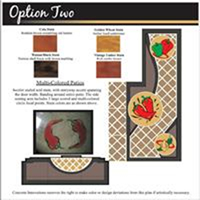 Project submitted by Concrete Innovations, Lubbock, TX.